The Nigerian Judiciary and by extension the Nigerian Bar Association has always been revered and regarded with the utmost respect. 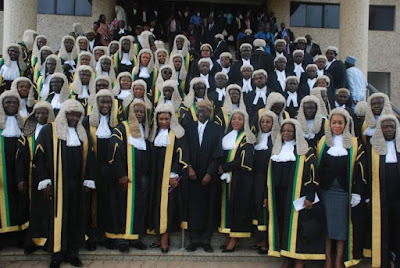 Looking back at the time when Jurists such as Justice Kayode Eso and legal titans such as Timi – The – Law practiced in this jurisdiction, one can say those were the good old days. However, currently things are not so good and the tales of woe within the Bar and Bench can be traced to the political class, who have invaded our honourable chambers with the poisoned wine. Of the 3 arms of government, the Judiciary is the most reserved as our learned justices cannot so powerfully use the media like their counterparts in the Legislature and the Executive. Moreso, the Judiciary is guided by a code of ethics and the rule of law, one thing we can debate is lacking in our political class who make up the Legislature and leadership in the executive. Many Nigerians complain about the slow process of justice and sometimes the inability to get justice. This is because the Executive made up of past and present Presidents and Governors have bastardized the process with the intention of keeping the Judiciary under their thumb. For instance, why have State Governors blatantly refused to ensure the financial independence of the Judiciary but have been satisfied to allow their Chief Judges come to them with begging bowls. No State Judiciary can buy cars for their Judges without approaching the Governor, this is an intentional whim of politicians and the Executive to silence the voice of the people. “ It is no secret that this government is dissastified with the alarming rate in which the Supreme Court of Nigeria under the oversight of Justice Walter Onnoghen has serially set free, persons accused of the most dire acts of corruption, often on mere technicalities”. From the above it can be seen that the President wants the Chief Justice of Nigeria, not only to give judgments that are favourable to his government but for the CJN to meddle in the trials before his court and most importantly to ignore the provisions of the law and due process by ensuring a conviction by all means. An act which is in fact an abuse of power. Certainly, one must wonder if with the imposition of the acting Chief Justice, President Buhari may have found his man. With this background, one must salute the 20 Senior Advocates of Nigeria, who have risen to offer themselves as champions and titans for the rule of law. For in their joint statement, they have stated theirs is a cause to reform the Bar and Bench by engaging with relevant stakeholders. Most especially the Nigerian Bar Association, the body recognized to act on all things bordering on the welfare of lawyers. It is believed and hoped that though a number of the 20 SANs did not support the current NBA President in his elections, they have put aside all resentment from the loss and are now willing to work with the NBA President to ensure proper reforms are put in place, as to do otherwise would be to act like the politicians who have continued to disguise self interest as national interest and buried the Rule Of Law under the altar of political expediency. Furthermore, it is hoped that they will engage the Judicial Reform Committee, most recently Chaired by the Learned Silk, Olisa Agbakoba SAN and the Regulation of Legal Profession Committee chaired by Tony Idigbe SAN. Most importantly, well - meaning advocates of reforms should key into the programmes of those committees. Lastly, we must all work together to remove politics from our judiciary.